Ok, so I realize that the fact that the kids’ bedroom is FINALLY done is not a big deal to anyone but me (including my husband and my kids). 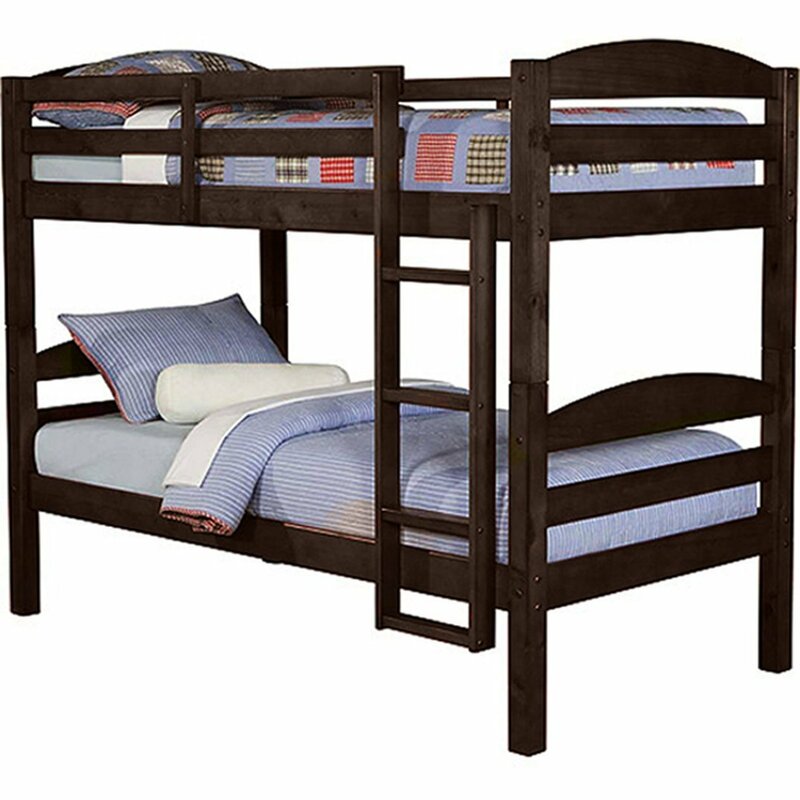 But it’s done and it’s consumed my life since Mother’s Day weekend when we put up the bunk beds and moved the kids in together. 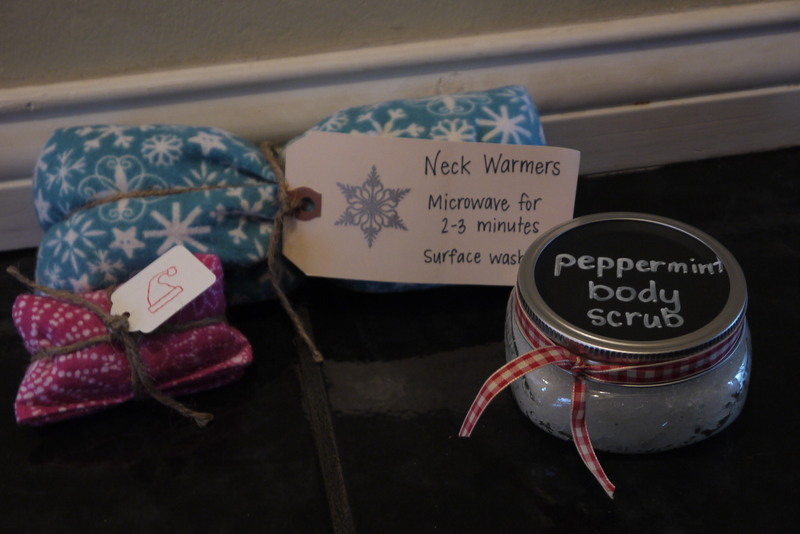 I had all these ideas, mostly thanks to Pinterest, and I learned a lot of fun new things. For example, I LOVE adhesive spray. LOVE IT. It’s fabulous. If you have never used it, find a reason to use it and buy some. Recovering boring white lamp shades is simple with a little adhesive spray. I also learned how to make lined curtains. Not a fun project but I’m glad I know how to do it (and using $5 Walmart flat white sheets makes a great and cheap lining for the curtains). 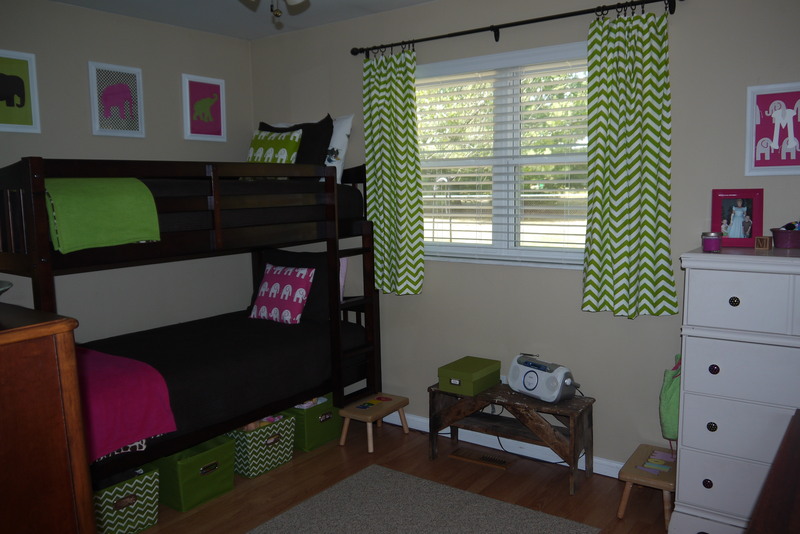 Figuring out a color scheme for a shared boy/girl room was tricky. I didn’t want it to be too girly or too masculine. I found this geometric elephant fabric at fabrics.com (love this website for fabric…great prices, great selection) and loved it. I was really into the chartreuse green and candy pink that seems to be a lot of places this year. Target was really into green and white chevron strip this year and made my dream of having cute under the bed baskets a reality. The toys are now confined to two baskets under the bed per kid. Heaven! (I hate toy clutter.) The brown quilts and shams were tricky to find. I searched EVERYWHERE for brown quilts with matching shams and finally ended up finding them online at Walmart of all places! 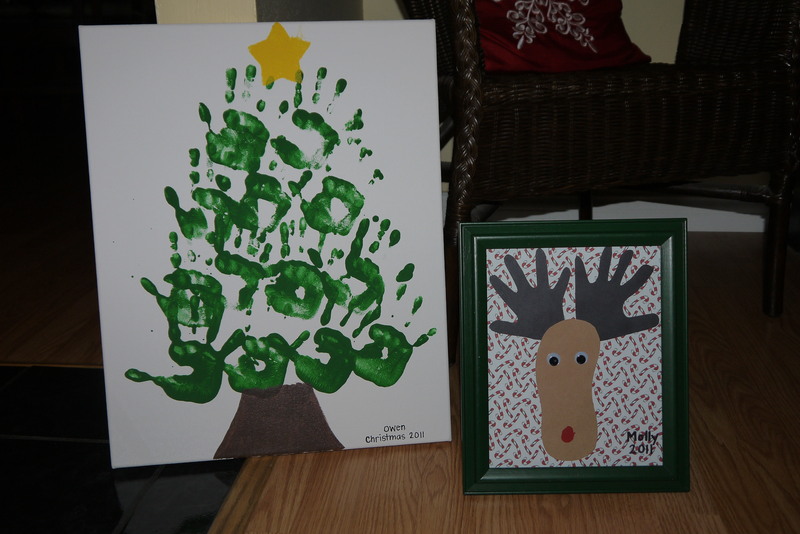 Next…wall art fun! 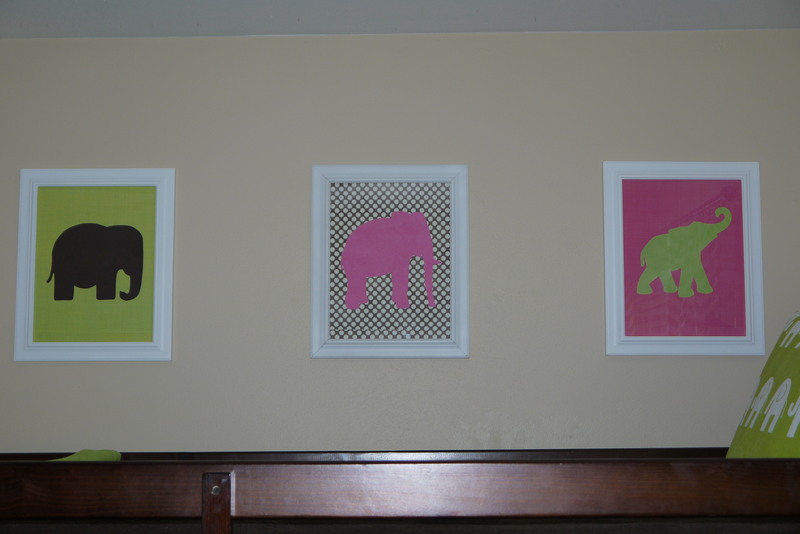 A Pinterest idea…silhouettes of elephants (found online) cut out of scrapbook paper, mounted on more scrapbook paper, and then framed. Easy peasy. On to the art wall. I wanted to give the kids a place to hang their creations but wasn’t sure I had room for a corkboard. 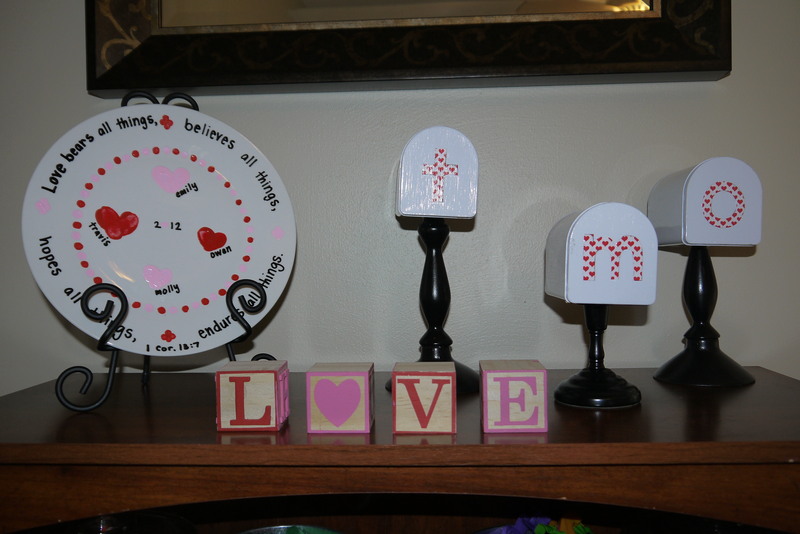 I found these wood plaques at JoAnn’s for under $2 each, painted them, glued a clip onto them, and VOILA! And the little shelves under the art wall make me so happy. Molly’s basket is pink, Owen’s is green, and they each get to put whatever little toys they’d like to keep in their room in the basket. No more toy clutter in this room! And the lampshade…remember when I mentioned adhesive spray? Love the stuff. I’d also been wanting to do something fun with embroidery hoops and colorful fabric. 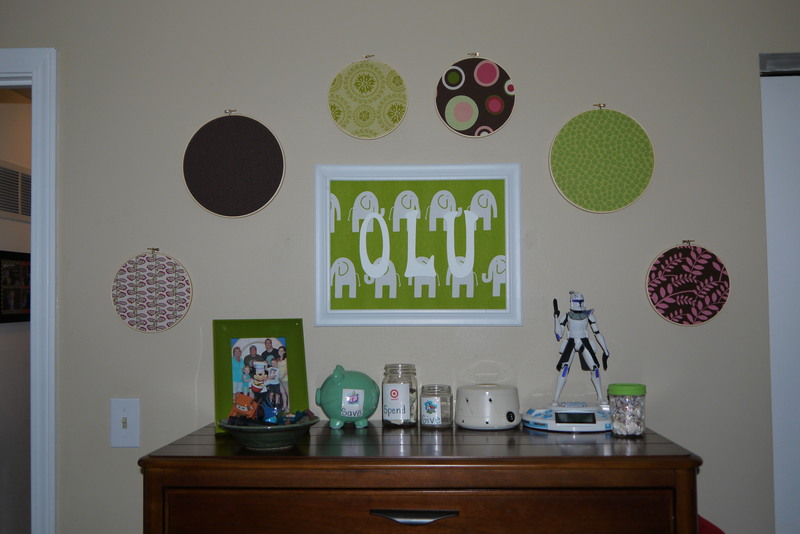 Owen’s wall above his dresser needed a little more life, and the embroidery hoops made it more exciting. I’m now obsessed with embroidery hoops on the wall and want to put them all over my house. 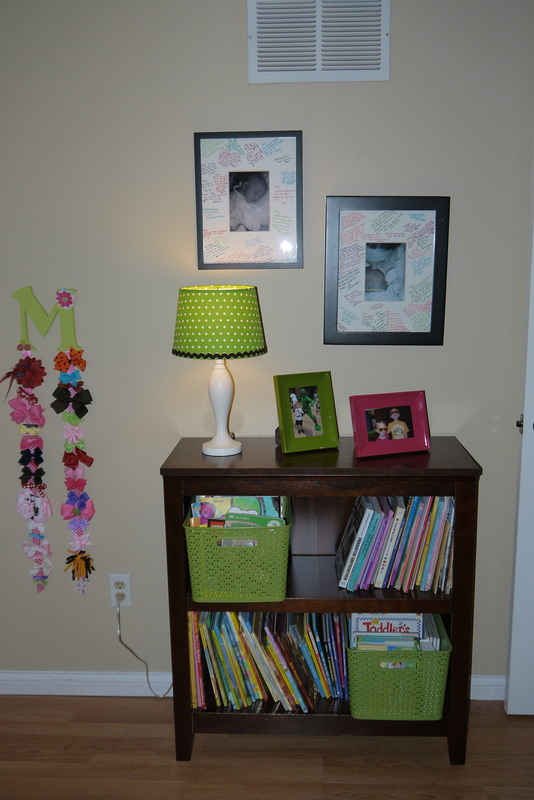 I needed a place in the room to hang the kids’ baby pictures, and I think they work over the bookshelf. When our kids were born, I’ve had our visitors sign the frame’s mat. I always love reading back over who visited us in the hospital. 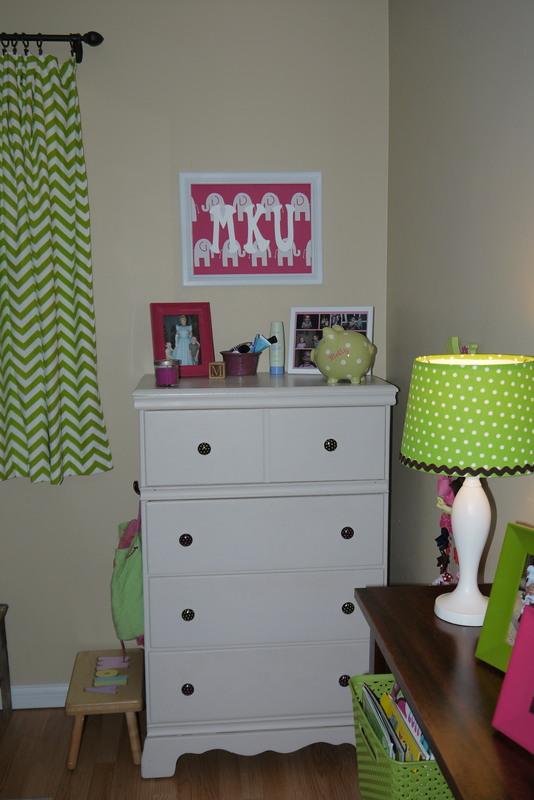 One more pic…Molly’s dresser. You can’t see very well in this picture, but I was so excited when I found these knobs for the dresser at Hobby Lobby. They are black with hot pink dots, and black with bright green dots. Perfect for this room. And it’s fun seeing my little girl using the dresser I used in college. Great Goodwill find all those years ago. And that’s pretty much it! It was fun to do, but with only 9 weeks left until the baby arrives, it’s time to get started on the nursery. It’s been over three years since our last baby was born and I barely even remember what we have. But I’m so glad that my big kids have a fun room to call their own since their lives are about to change forever! So…it’s been 2 months since my last post. I’ve never done that in all my blogging life. And there are reasons…the main one being that growing another human being is exhausting, especially when you’re chasing around two other crazy, wild children all day long. So if you didn’t already know…we are having another baby!! We are so super excited about this little nugget that is supposed to arrive around September 7. The kids cannot wait. Telling them was super special…and we caught it on video. I’m so glad we captured this on video. It’s been a couple of months since we told the kids and I’d already forgotten how sweet their reactions were. I love that their reactions reflect their personalities…Owen is thoughtful and quiet, while Molly is excitable and loud. I love that Owen wants to name the baby Prince Phillip (Molly has recently told us that she wants to name the baby Phil Collins…she has a serious obsession with Tarzan). I love that Molly wants see the baby right then. And I love that Owen asks if we are going to pray. He has such a sweet, sensitive heart. As soon as we were done with our little talk, the kids immediately started stuffing their bellies with stuffed animals and pretending to give birth. There’s been a lot of this kind of play going on over the last few months. It’s been fun having kids old enough to “get” what’s going on with this pregnancy. When I was pregnant with Molly, Owen wasn’t even 2 and he really didn’t get it. But now they do get it and they have lots of questions. Molly frequently asks me if I can take the baby out of my belly so she can hold it. One day she lifted up my shirt and started pulling on my belly button. When I asked her what she was doing she told me she was trying to look at the baby. To say she has a baby obsession would be putting it mildly. 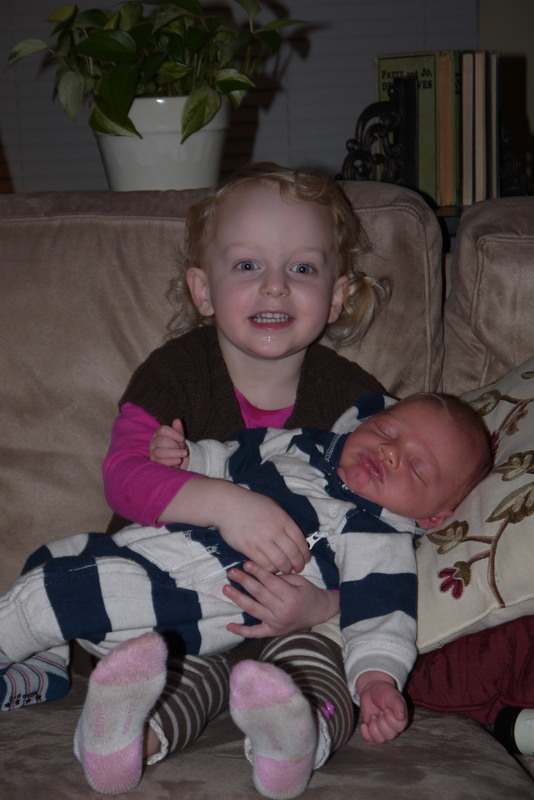 Can you tell by her crazy eyes in this next picture how much she is loving every second of holding baby Eliot (my friend, Abbey’s, newest baby)? 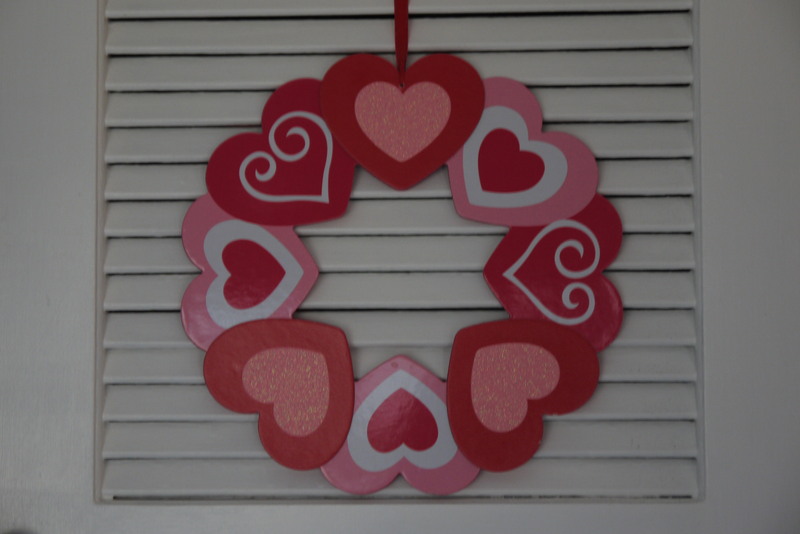 But the thing they’re most excited about will be making it’s debut in a couple of weeks… So now that I’m feeling better and don’t spend my days on the couch watching episode after episode of Brothers & Sisters, I’m in full room decorating mode. They can’t wait to sleep in the same room, and I can’t wait to transform it into a fun shared space for both of them. 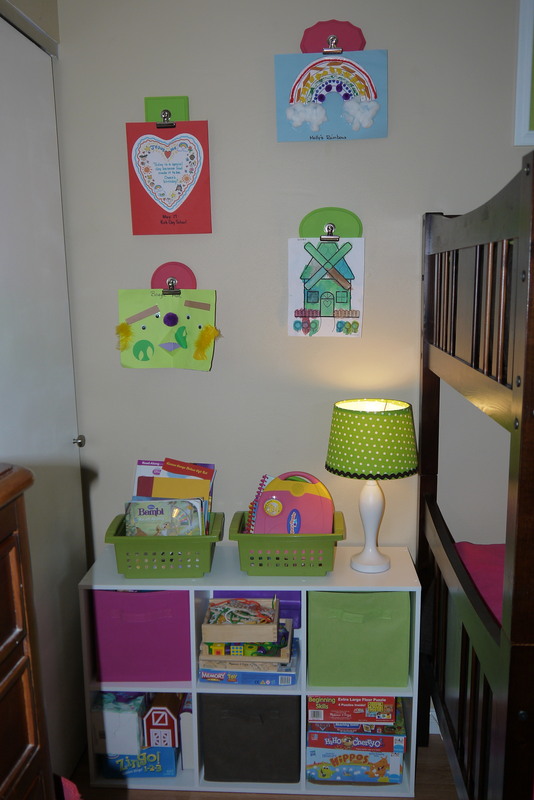 Maybe sometime before #3 comes along I’ll get around to posting pictures of their new bedroom. No promises. During the very small bits of time during the day that I have to myself, sleep sounds a whole lot more enticing then turning on the old computer. But I’ll try! good-bye paci, hello big girl bed! Big changes around here. 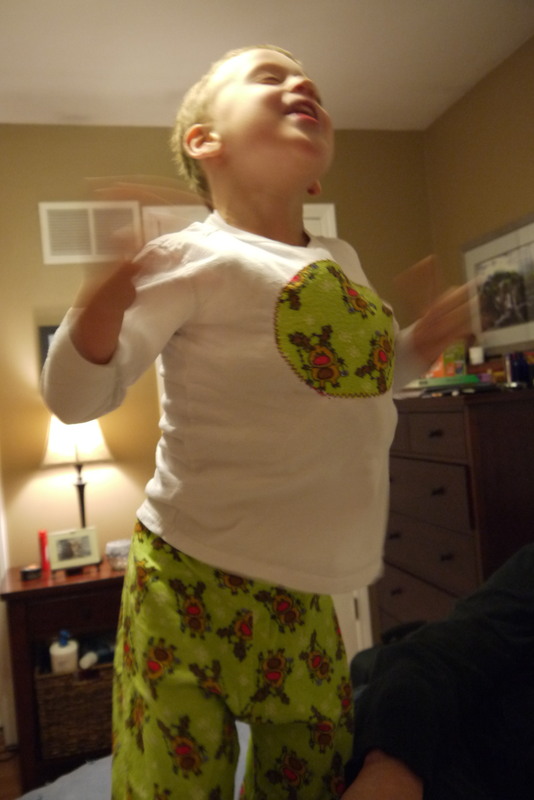 Life altering changes…both for the little gal and her parents. Molly is no longer in a crib. And Molly no longer has her ga-ga (her paci). We decided to make these changes right after Christmas. December 28 to be exact. And today is January 23. And we are still fighting her on it. Here’s a little summary of our journey. 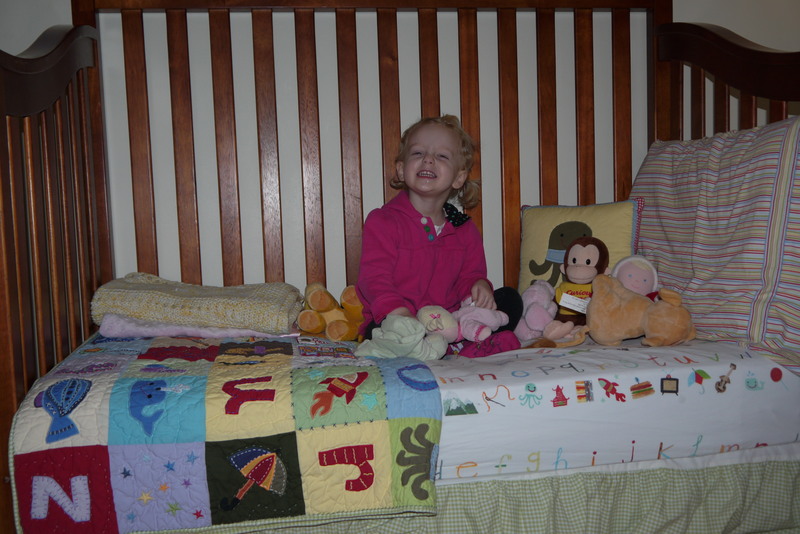 I had the brilliant idea that we should take away Molly’s ga-ga at the same time that we moved her into a big girl bed. 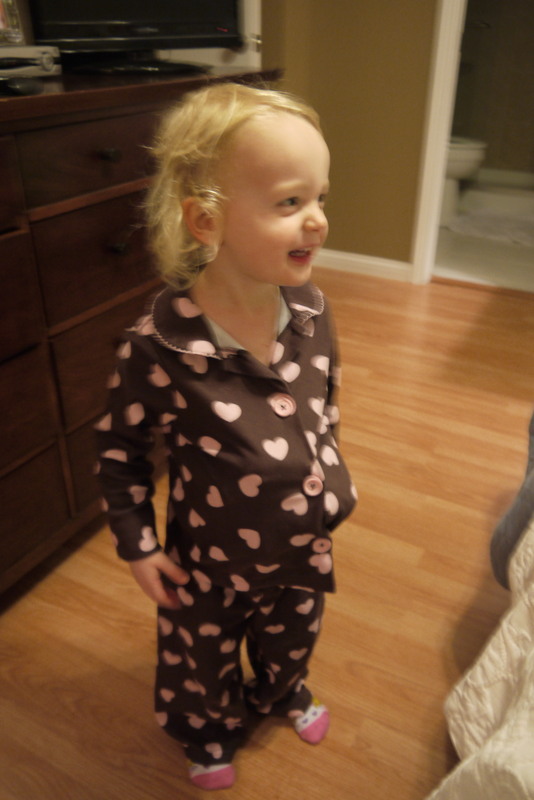 I thought we could help her see that she’s now a big girl in a big girl bed and big girls don’t use ga-gas. At first it seemed brilliant…but that was before bedtime. We also had heard of friends who’d used the strategy of snipping the ends off the pacis instead of just taking them away cold turkey in hopes that it would help wean the child off the paci. That’s the strategy we chose to employ…for better or for worse. We sat her down and explained the excitement of the big day. She seemed cool with it all. She didn’t even freak out at all when Travis snipped the ends of her precious ga-ga. Inwardly I was praising my wisdom as a mom…I’d waited until she was ready! I’d come up with a master plan about ga-ga removal and big girl bed transition and the child understood it!! This was going to be the smoothest transition yet! And then it was time for naptime. She didn’t sleep. Not a wink. She screamed and screamed and screamed and screamed. We heard her sobbing these words, “WHY DADDY CUT MY GA-GA??? ?” It broke my heart. Poor kid had never known a night without her beloved ga-ga and was having to learn to sleep all over again. But naptime only lasts a couple of hours and then they get up and life goes on. But then came bed time. And it was ugly. UGLY, I tell you. The child had become a monster. She didn’t just sob in her pathetic little sad voice about her grief over her chopped off ga-ga. She screamed. Like a big old lion roar of a yell. “NNNOOOOOOOOOOOO! !” And it wasn’t a sad yell…it was mad. The girl was furious with us. She kicked the wall. She threw her stuffed animals across the room. She threw any and everything she could get her hands on. And she just kept on going. The first night lasted 2 hours. And then she slept. This pretty much has continued for the past 31 days. It’s gotten better. In retrospect, I’m glad we did both big transitions at once. At least we didn’t have to get all the way through ga-ga removal only to enter a new level of parenting insanity and transition to the big girl bed. We just did them both at once. She really stays in her bed quite well. That was only a problem for the first few days. But when faced with the consequences of getting out of bed to announce to us that she was “going to wake up now”, she really hasn’t done it since. And nap time has gotten so much better. I was worried that she wasn’t ever going to sleep during the day time again. And this made me very very very sad. And tired. But the naps have returned. They’re much shortened…going from close to 3 hours to an hour and half tops. But I can’t complain. I know there are kids out there that are done napping by 2 and a half. But bed time. It’s still nightmarish. There have been a couple of nights in the last 31 that she’s gone to sleep without crying, but I’m pretty sure the only reason for that was pure exhaustion. Every other night she’s screamed for up to 2+ hours. I’d like to say that I feel like it’s getting better because the crying will only be 10 minutes one night, but then we’ll have another 2 hour night and we’re back. We’ve tried having her take a special toy to bed in place of the ga-ga. She gets excited to pick it out. But then that fun ends quickly. We actually let her have her ga-ga in her bed with her and she clutches it in her hands. That doesn’t seem to help. And the thing about it is, I know she can go to sleep on her own. I KNOW she can. She’s done it for 2 and a half years. She just hasn’t done it without her ga-ga. So now that it’s been 31 days, I feel like my little stubborn, strong-willed daughter is making this into a power thing. Because I’ve caved on many nights just to get her to STOP YELLING, I’ve gone and sat with her until she fell asleep. Now she wants this every night. I’ve created a monster! We’ve also learned another fun fact about our little gal, without the paci in her mouth at night…she talks in her sleep. But it’s not really talking…she yells. Loudly. She screams NO! in a very defiant voice while she’s sleeping. We’ve run in her room numerous times at night to see what’s wrong only to find that she’s sound asleep and yelling NO! in her dreams. I think she’s dreaming about ways to challenge me…little stinker. So…this explains the lack of blog posts. We’ve just been dealing with our head-strong daughter. And trying to catch a few winks of sleep between her sleep-yelling sessions. Parenting…it’s not for the weak. It was two weeks ago, but it was great. Christmas Eve started off with church and then dinner at my parents’ house. 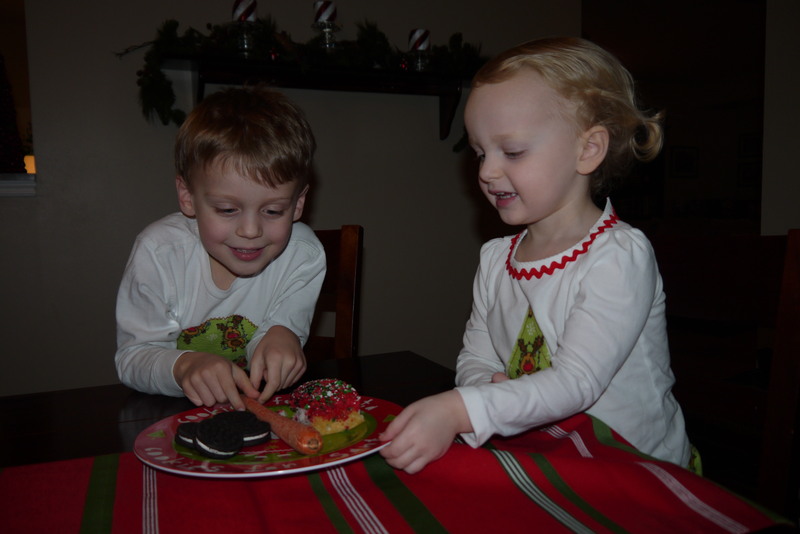 We came back home to get our cookies out for Santa. We made sure to leave a carrot for Rudolph, and the kids really wanted Santa to have a piece of Jesus’ birthday cake. On Christmas morning, we woke up at our own house. The kids were super excited to see what Santa had brought them. They were excited to see that Santa ate their cookies and cake and that Rudolph gnawed on their carrot. 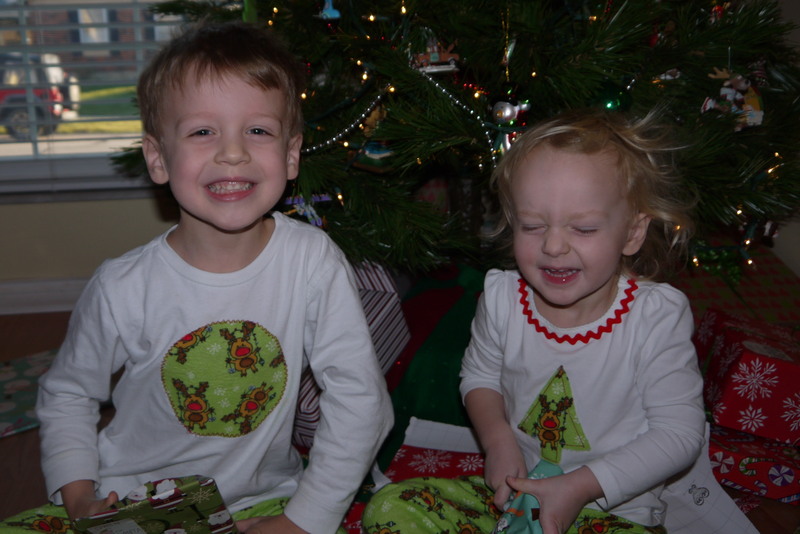 But they were even more excited to see the presents under the tree. It was like a hurricane of presents…fast and furious. And with crazy bedhead. Uncle Nate’s gifts were a big hit. 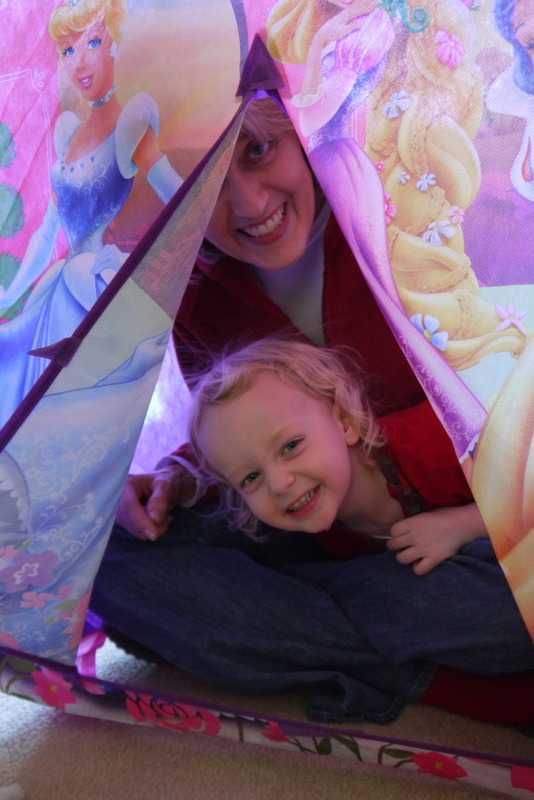 Molly’s princess tent was probably her favorite gift of Christmas. She loves to make the adults go in and play with her. 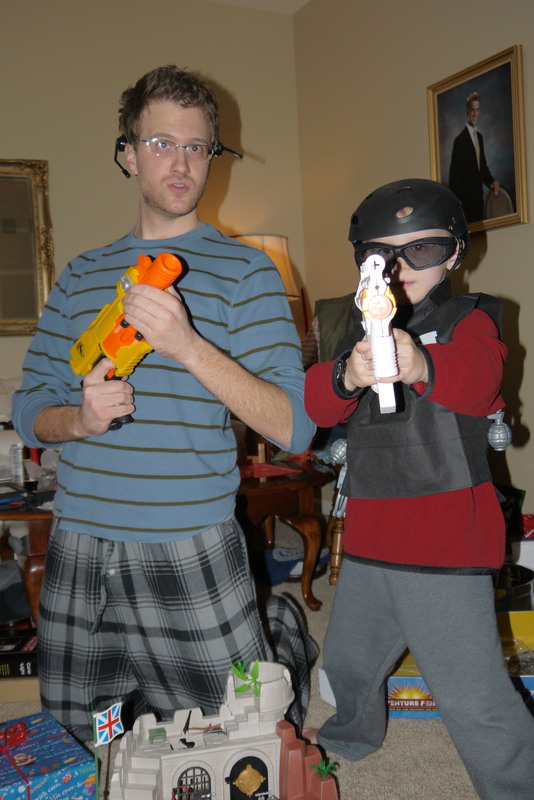 The SWAT team costume and nerf gun Uncle Nate gave Owen were a favorite of his, too. Christmas with my family was so much fun. And then the day after Christmas we had Christmas #2! Jeff, Julie, and Grandpa Lane drove in that morning bringing a whole lot more presents for the kids. 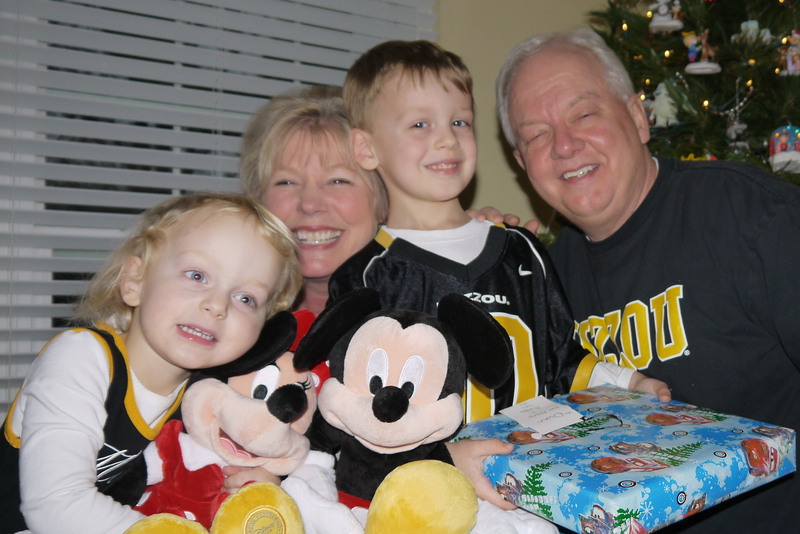 But the major present was…..
…a trip to Disney World!!!! They are taking us over Molly’s birthday week in April! We are so excited. The kids don’t really know what to expect, but they really loved all their Disney-themed presents! Christmas was fabulous. 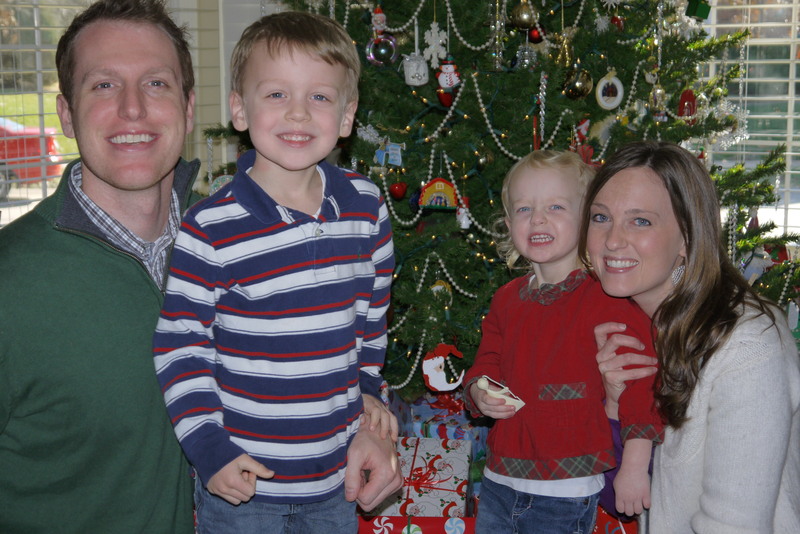 It was the first Christmas in our married life that we stayed in St. Louis and didn’t travel. It was so relaxing and being in our own home was so special. But goodbye 2011…hello 2012!! 1. Our family read advent scripture in church the first Sunday of December. We each had a part to read, including the kids. 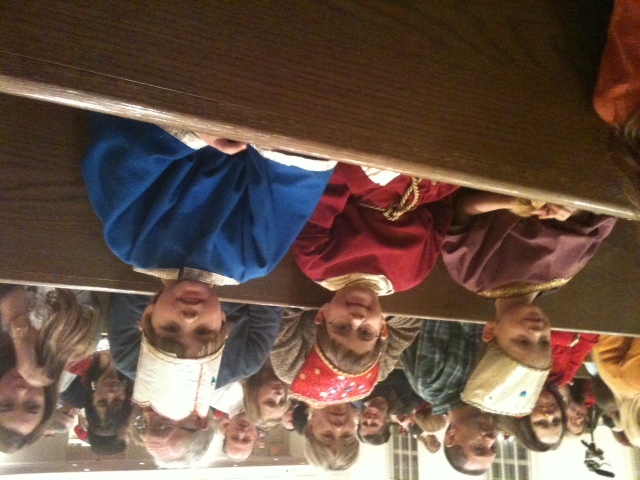 Owen said, “Wonderful Counselor, Mighty God” and Molly said, “Everlasting Father, Prince of Peace”. 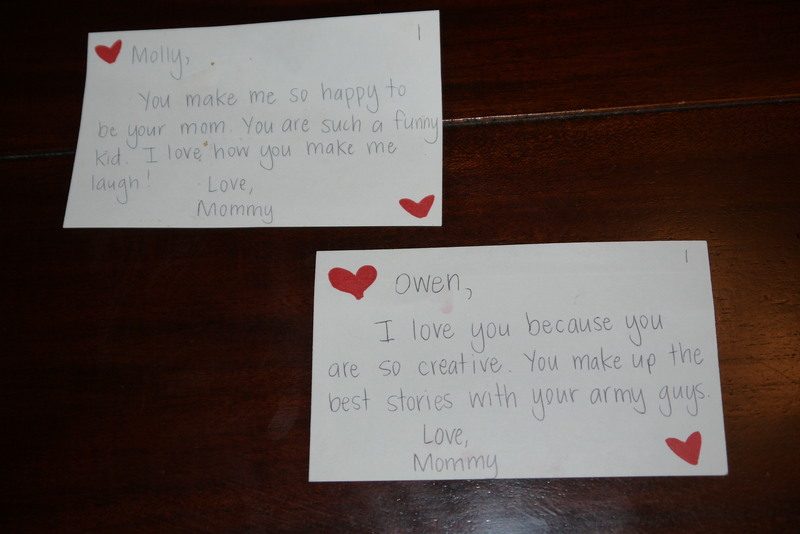 They both said the words loudly into the microphone, Owen more clearly than Molly…but both were adorable. It was a great way to start the Christmas season. 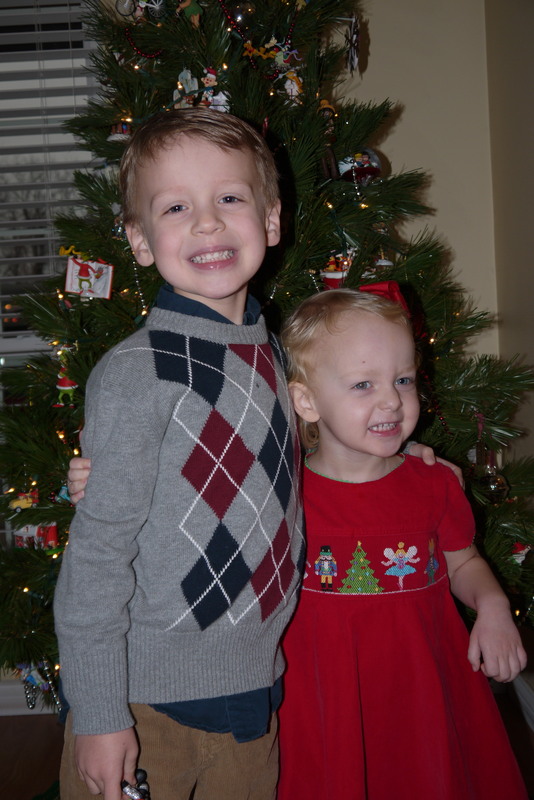 Here’s a picture of them before we left for the service in their Christmas clothes. I know I’m biased, but aren’t they just adorable?? 2. We’ve watched lots of Christmas movies, including one new one this year. We took the kids to see Arthur Christmas in the theater…it was so cute and the kids loved it. And praise the Lord for popcorn. That’s the only way we can get Molly to sit through an entire movie. 3. We’ve looked at lots of Christmas lights, but my favorite was when we all bundled up and went on a walking tour of our neighborhood’s Christmas lights one evening after dinner. It proved to be a great way to see the lights…and a fantastic way to wear out some kids with severe cabin fever. We also took the kids to see the Wild Lights at the Zoo. They loved it, but Molly was really confused about why we weren’t able to see any animals. She didn’t really understand that the point of this trip to the zoo wasn’t about the animals, rather it was about enjoying the Christmas spirit while we looked at the pretty lights. 4. 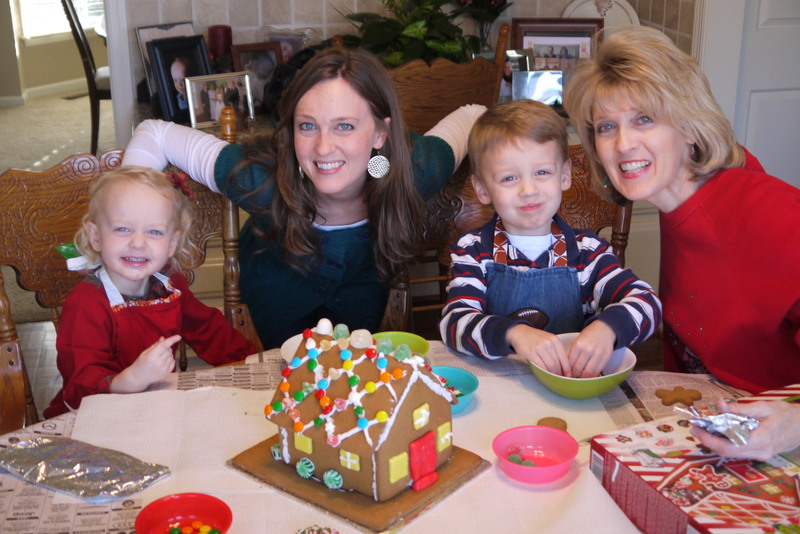 We made gingerbread houses with Mimi. This has become one of our favorite yearly traditions. 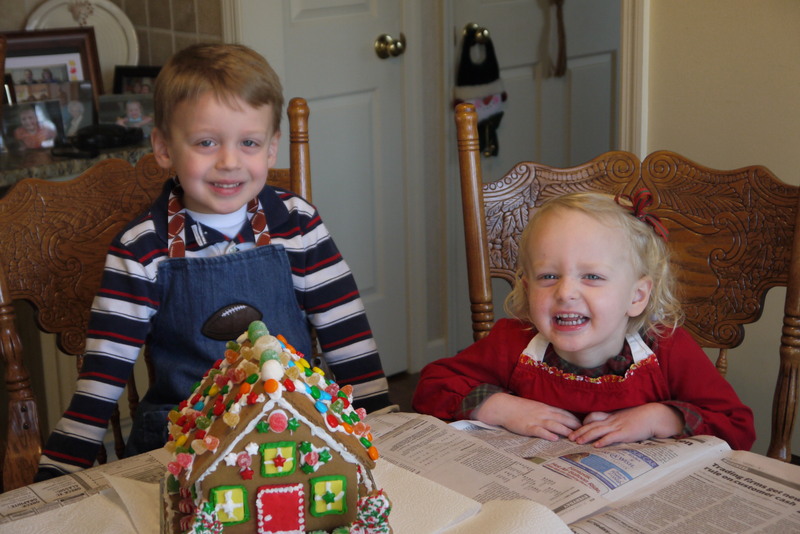 The kids both got really into it this year…I think they might have actually stuck more candy on the house than in their mouths this year! And the final product turned out pretty cute! 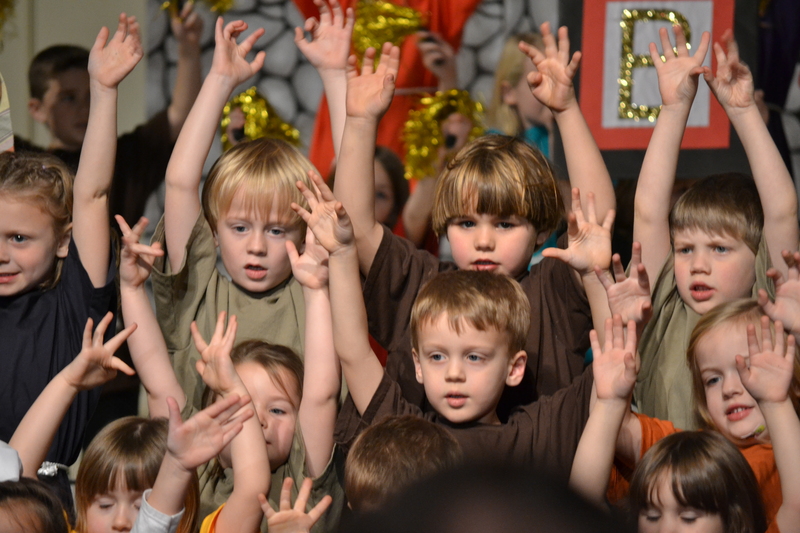 When he wasn’t playing the part of a wiseman, he was belting it out with the preschool chorus. 6. 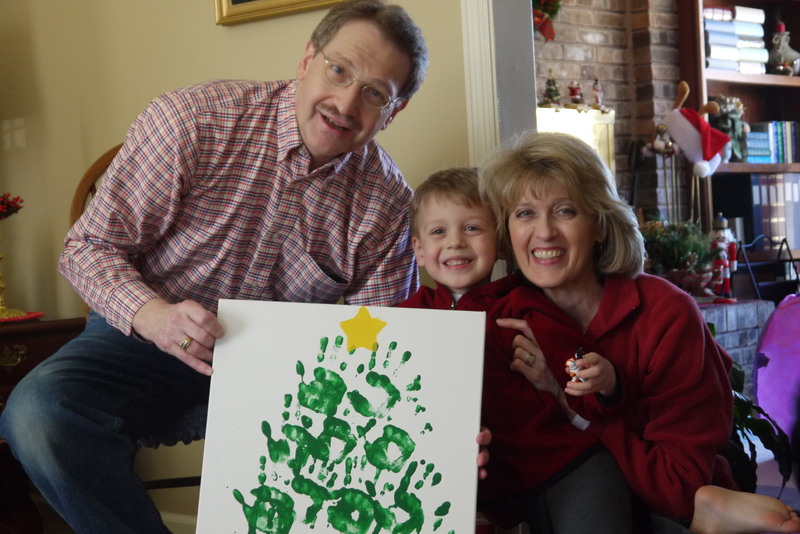 This December marked the end of my 18 month run as Assistant Director of Children’s Ministry at our church. I’ve thoroughly enjoyed my time working with the children, but I miss being involved with adult aspects of the church. It’s also gotten very difficult to juggle my odd hours with Travis’ increasing work and travel schedule. It was a good run, but it was time for me to resign. 7. 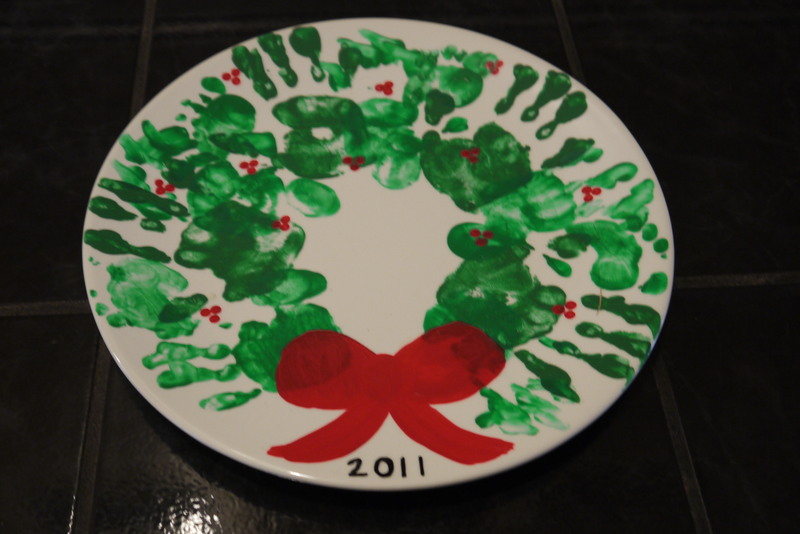 Owen’s Pre-K class had a morning for moms on December 16. 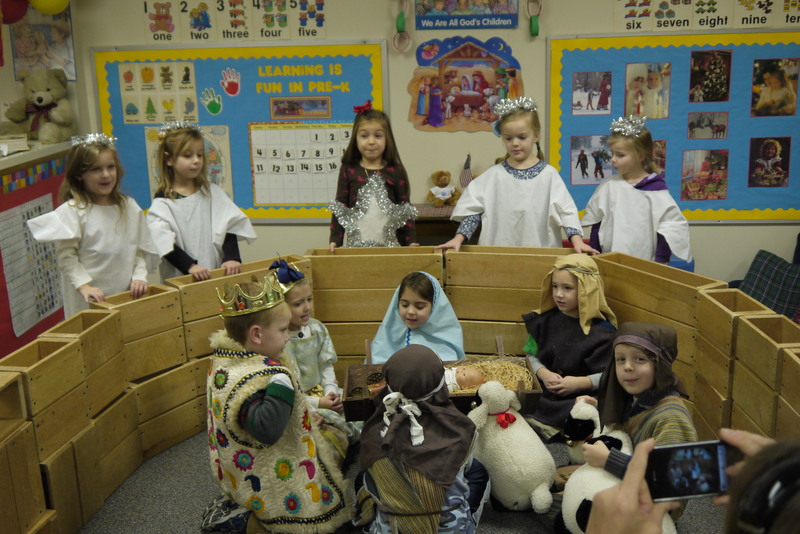 All the kids participated in a reenactment of the nativity story. 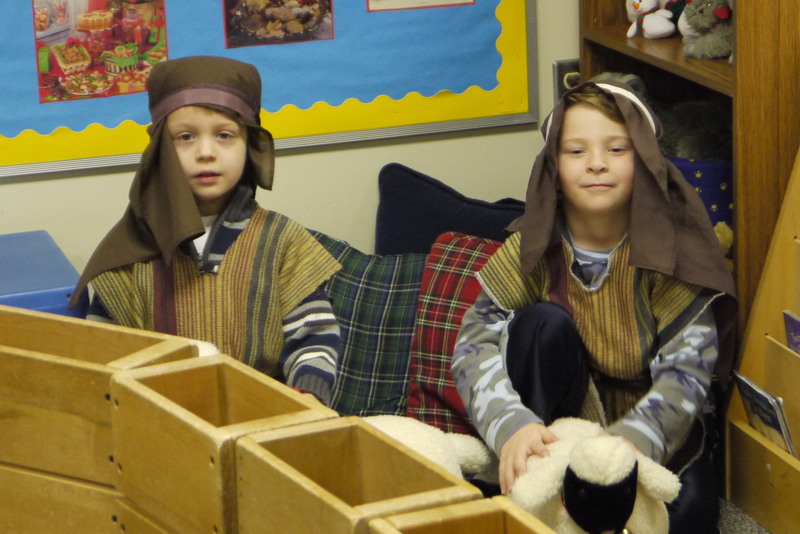 Owen and his friend, Nick, got to be shepherds (which was evidently the coveted role according to him). Everyone in his little class had a role. Here they all are, gathered around the manger. 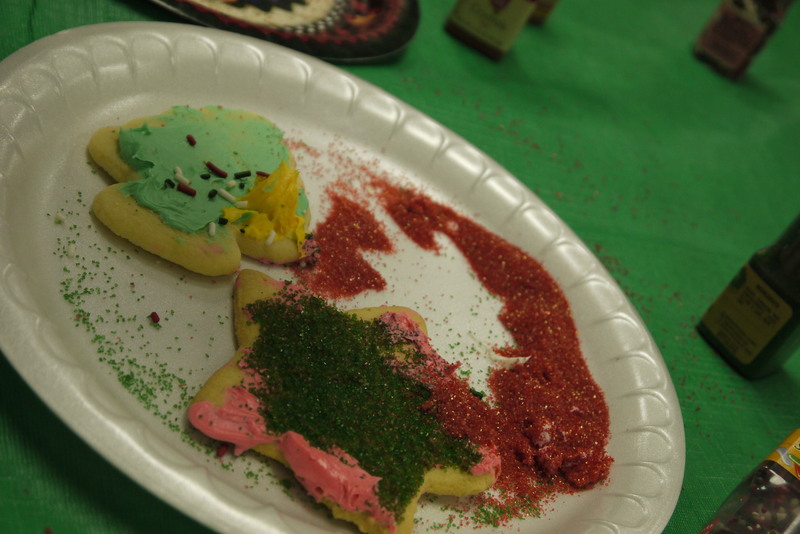 Afterwards all the moms got to decorate Christmas cookies with our kids. As you could tell from my previous post about Jesus’ birthday cake, Owen is a big fan of sprinkles. And that held true for cookies, too. 8. 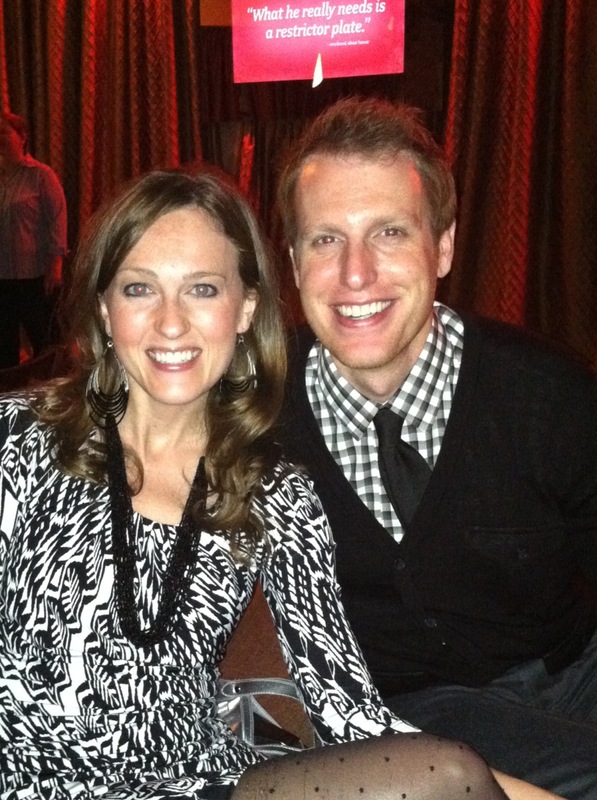 Trav and I went to his annual work holiday party. It was at a great restaurant downtown called Copia. This was his 9th holiday party with his company. Crazy. We’ve gone from being the young ones at the parties to being considered some of the older ones there (advertising tends to draw a pretty young crowd)…not to mention I’m the only stay-at-home mom and probably the only female in the room that drives a minivan. That being said, I was still able to have some great conversations with some of the girls he works with. Here we are…my one occasion each Christmas to buy a new dress and look fancy. 9. One more thing worth mentioning…I let Owen and Molly pick out something to give the other for Christmas at the dollar store. They each got to have “dates” with me to the store to pick out their gift. It was cute to see them picking out a toy for their sibling. They often picked out things they personally would enjoy (I giggled as Owen tried to convince me that Molly would enjoy some wrestler action figures…who am I kidding…she probably would). What they ended up picking out was great. Owen chose a baby alligator figurine for Molly because “she likes to play with animals and she like alligators”. And Molly chose a microphone. You’ve seen them…the ones that are echo mikes that take no batteries but somehow magnify your voice. Once she decided upon her gift, she proceeded to test it out through the remainder of the store yelling “I AM A BAD GUY!! !” into the mike. Over and over and over. I splurged and secretly bought another mike just for her…I could see the fights they’d have over that silly thing and decided to make my life a little easier by spending the extra buck. I can’t wait to see them give their presents to each other on Christmas morning. My guess is Owen spills the beans before she gets the wrapping paper off. That pretty much wraps up December! Have a Merry Christmas! !